With its torrefied Sitka spruce top and American Sycamore back and sides, the Martin D-18 Sycamore marks 50 years of Martin guitars made on Sycamore Street. Fifty years ago the Martin Guitar Company entered their modern era, with the opening of a new factory on at 510 Sycamore Street, in Nazareth Pennsylvania, just around the corner from the original Martin homestead on Cherry Hill. 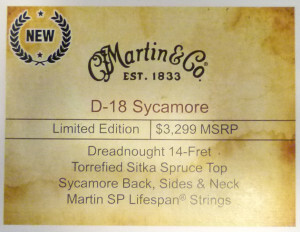 To mark the anniversary, they created the D-18 Sycamore, a limited edition commemorative model based on the latest version of the D-18, but made from American sycamore, with a top of torrefied Sitka spruce from the Pacific Northwest. There will be a total of 50 made. The D-18 has its own venerable history, and recently it had a make-over that included many upgrades like ebony for the fingerboard and bridge, forward-shifted scalloped braces, and the addition of the high performance neck with its fast, sleek feel and string spacing 1-1/16” wider at the bridge than the previous version of the D-18. This model shares all those features, but has its own unique sound thanks to that sycamore body. This abundant hardwood is found as shade trees across the continental United States, and falls somewhere between maple and mahogany in terms of density and in terms of tone. 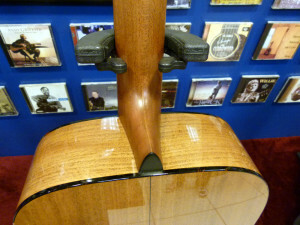 Although it seems to vary when it comes to hardness, anything found on a mandolin or guitar is harder than not, and likely harder than instrument grade wood from the various maples, including Acer pseudoplatanus – the species of maple called “sycamore” in Europe, often used to make violins and flamenco guitars. So this guitar has a lot of pop, as the sycamore is highly reflective. It has solid treble notes that are notably strong, but with great definition. So, I stop short of calling them fat. Rather, they are forceful but solid, like a Marine sergeant, not a Sumo wrestler. The bass notes are likewise very well defined in terms of the fundamental note, but they do not have the warm, swelling fullness behind them that is heard in the normal D-18. I would not say this voice is as clean and clear of undertone as maple, but it is more in that direction than it is like mahogany. It sounds like a more complex maple, with thicker top notes, more overtones and complexity over all, like mahogany, but with a maple-like bass that shifts the focus into the mid-range, which has the same kind of defined top notes and high overtone ring as the trebles. I realize this description might make it seem more like a Jazz archtop than a dreadnought. It is not. It still has plenty of the complexity, resonance and sustain one looks for in a dreadnought. In fact, it excels at traditional flatpicking, with the kind of punch and “cut” that would leap out of a Bluegrass jam when it is time to switch from playing rhythm to a solo break. But the harmonic overtones increase in complexity as you move up the registers, blooming in the high-mids and treble, leaving the bass clearer, dryer and leaner than one hears in a typical Martin dreadnought. 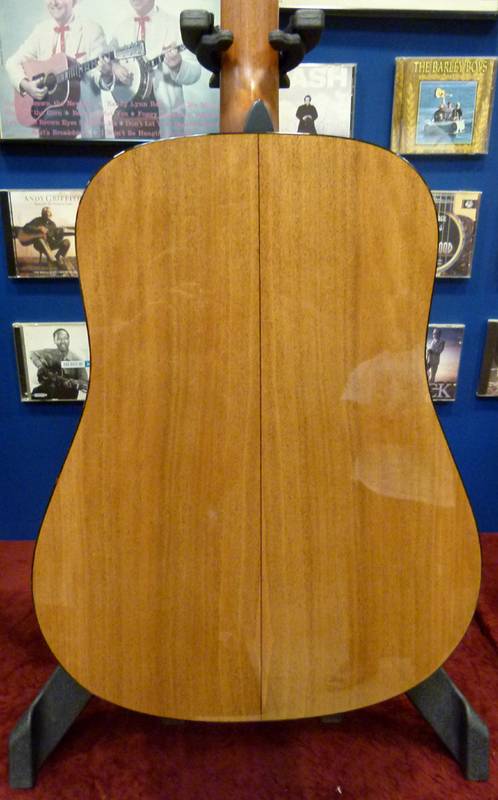 In some respects it is sort of the opposite tonal distribution of Madagascar rosewood. Where Madagascar rosewood has a mahogany-like treble that then dives into a rosewoody bass, this sycamore dreadnought has a maple-ish bottom end that moves into a more-mahogany-like resonance and harmonic layout as the voice ascends the mids and on into the treble, where there is a mixture of fatter mahogany notes and maple prettiness in the highest harmonics. This makes it uniquely suited for playing in an ensemble where one may want that traditional dreadnought sound for sweeping chords, lead fills and those solo breaks, while still fitting into a mix of instruments, without having to worry about a boomy bottom end mushing into the territory of the bassist or keyboardist. And it would be a very nice addition to a guitar ensemble that already featured darker, warmer dreads made from rosewood. But this particular dreadnought would not be my first choice in group playing if I was spending the evening providing the bottom end throb when there was no bass player on stage. The D-18 Sycamore should also make a very good guitar for accompanying singers with high voices, like many female performers and the serious Irish tenors among the fellas. Those high harmonics would add some backup singers. Likewise, its strong fundamentals and angelic overtones should work very well as a recording instrument, as both the open undertone and signing overtones never overwhelm the main note played on each string. Some of that extra openness and certainly some of the pronounced chime of this particular instrument are courtesy of the process known as Torrefication. Marketed under different names, torrefied wood is “baked” at extremely high-temperatures in a low oxygen kiln until its moisture is removed and its chemical composition changes dramatically. Originally developed to make wood resistant to decay, it was accidentally discovered that such treatment provides some tonal properties heard in vintage instruments with very old spruce tops. In fact, it has been used for some 200 years to treat violin soundboards for the exact reason. But it is new to the world of guitar luthiery. Read more about Torrefication HERE. I have no reference to go by when it comes to sycamore dreadnoughts. But I have been around Sitka spruce a long time, on all sorts of guitars. I will venture to say that the drier bark popping out of the sound hole when playing hard, as well as the hammer and anvil ring off the trebles, and the open, expansive quality down inside the voice of this new guitar all have been influenced by, or are a direct result of the torrefication of this spruce soundboard. Otherwise, I would say Sitka spruce was the perfect match for the more-complex-than-maple-less-warm-than-mahogany tonewood behind it. Engelmann or Italian spruce would have put too soft a focus on all that chimey stuff ringing between and above the strings, so there would be a loss of clarity to the overtones. Adirondack spruce might have given a bit more bass and definition to the undertone way down at the lowest end, but the overall voice could have become too snappy and spanky and dry, while the trebles would have lost that muscled thickness. Sitka is a broad brush stroke sort of spruce, turning up some warmth in the harmonics and thickening up the fundamentals without coloring the sound of the backing tonewood too much. But the torrefication seems to have added a bit more to the chime and ring thing, while adding some drier definition, particularly in the mids, so that it has a dash of Adirondack thrown into the overall tonal pallet. When it comes to looks the sycamore is attractive in a tanned blonde sort of way, with grain lines of fine black specs, resembling ground pepper, or more like iron filings gathered by a magnet into rows, arches and feathered patterns. 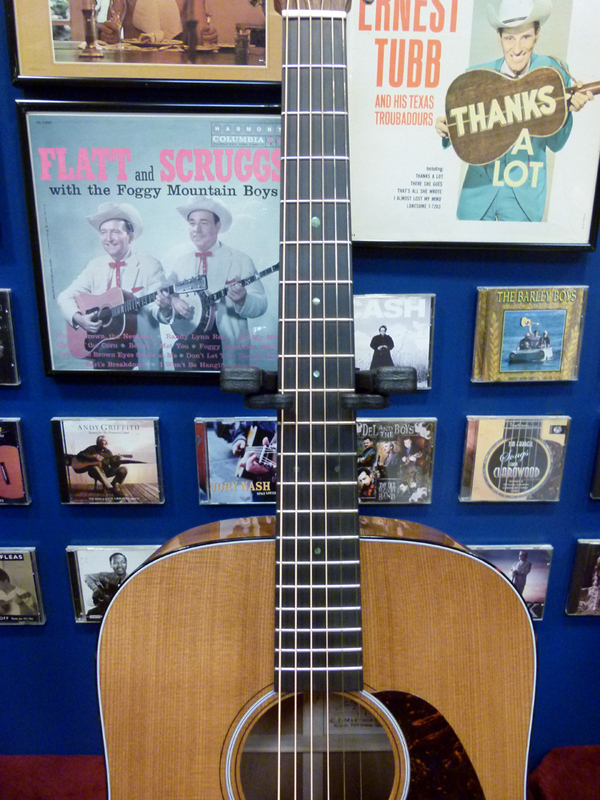 And the brownish streaks on the torrefied spruce top make the guitar look almost as if the entire thing was made of the same sort of wood, when you see someone playing it from a ways away. I very much like the choice of green abalone for the fingerboard dots, which stand out as cool and interesting without being flashy, as does the faceplate of on the headstock, which is figured Indian rosewood, but stained lighter than usual to fit into the overall color scheme. It is basically the same as the new D-18 when it comes to construction, dynamics and playability. It responds well to a variety of styles and levels of attack, without the player ever needing to worry about playing too hard. For those unfamiliar with the new neck and string spacing, it is less of a change for those used to the 1-11/16” necks with 2-1/8” inch spacing, than those who are coming from the vintage specs of 1-3/4” necks and 2-5/16” string spacing. But I adapted easily enough when I bought a D-18E Retro. And for people who play above the 5th fret, that sleeker neck profile is a thing to be embraced with great pleasure, particularly if you require things like thumb-fretted partial barre chords, and the like. 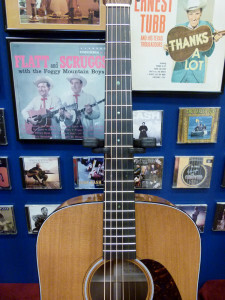 This is a Martin dread that should appeal to someone interested in something a little different, while still having a familiar feel and sound to it. I was immediately taken by the forthright ring from the top notes, but I came to wish it had more throb off the lowest E string. Still, that shift of the bass out of the boomy undertone and into the popping fundamental voice will likely be exactly why some folks buy this guitar and feel lucky to have it, as their only guitar, or as a singular voice among a broader collection. List Price: $3,299. 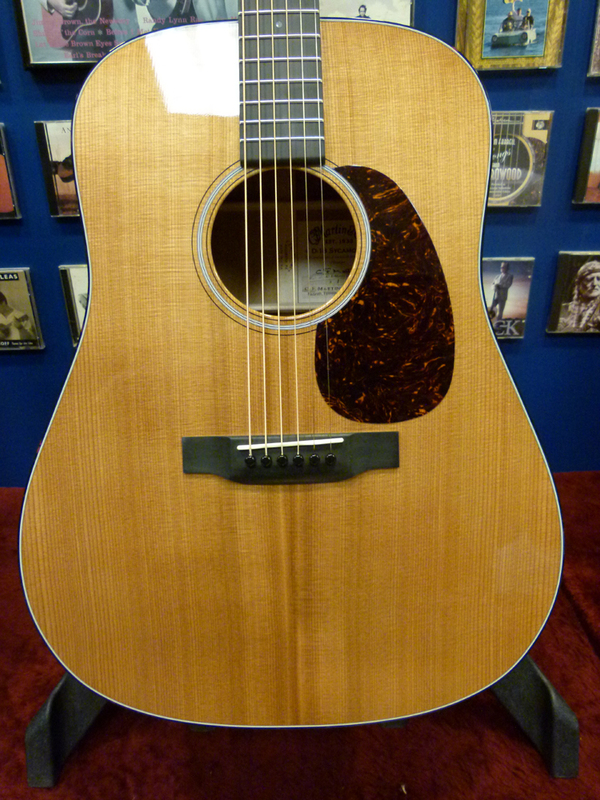 Call your Martin dealer for the real price.